Good money management means understanding the risk tolerance of each client. And we do. It is their risk tolerance, not ours, that is paramount. 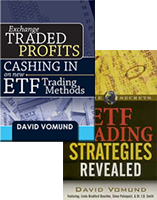 David Vomund, of Vomund Investment Management, was ahead of the pack in recognizing the explosion of investor interest in exchange-traded funds (ETFs). His book, ETF Trading Strategies Revealed, was one of the first to exclusively cover ETFs and remains a best-seller today. David followed that up with the more in-depth Exchange Traded Profits, published in 2011. It covers many of the analysis techniques that David uses in his managed accounts. Contact us today for a complimentary portfolio review.